With rapid punk guitar rifts, pop-dance rhythms, and a reminiscent grunge voice, FAVX has developed a sound that unites three genres into one style. Based out of the underground music scene of Madrid, Spain, FAVX is comprised of Dani (vocals and guitar), Nico (drums), and Carlos (bass). The independent culture in the underground scenes of Spain has been a major influence on their collective sound and success. “Welfare", their most recent record, brings us twenty minutes of unpredictable and unconfined music. After the release of singles, an EP, and a worldwide tour, FAVX is making noise in 2018. We had the pleasure to spend some time and enjoy the sounds of FAVX during the Fluffer Pit Records showcase at SXSW. Teal Magazine: How was your experience at SXSW? FAVX: It was fun and exhausting, but we were very successful. We made it, we survived the food, played seven shows, discovered new bands and made a lot of new friends. We can’t wait to come back next year. Teal Magazine: Was it your first time playing at SXSW? FAVX: Yes! Dani played with his solo projects, The Parrots, and King Cayman, in 2017. This was FAVX’s first time. Teal Magazine: What would you say are major influences to FAVX’s aesthetic and sound? FAVX: The three of us come from such different backgrounds, so we don't have a common root. However lately, we’ve been listening to Perras On The Beach, Palm, Sloppy Jane and BADBADNOTGOOD. When touring we even exchange our clothes between us so, in the end, our style is like a chaotic mix. We always like to think that our sound as a band is the sound that we would like to consume. Teal Magazine: Are any group members involved in projects outside of FAVX? FAVX: Dani plays in his solo project King Cayman, and also with The Parrots. Nico has an electronic project called Plomo. Carlos makes bird sounds in the forest. Teal Magazine: Why is your music in English and not in your first language (Spanish)? Is it easier to debut outside your country if your music is in English? FAVX: Our main music influences sing in English, so we do as well. Though it is not our native tongue, we feel comfortable enough with it. And yes, we really think that it is easier to be understood when our lyrics are in English. Teal Magazine: If you were to tour with someone, who would be on your dream tour? FAVX: We would love to tour with The Chats. They are an Australian punk band and we love their music. 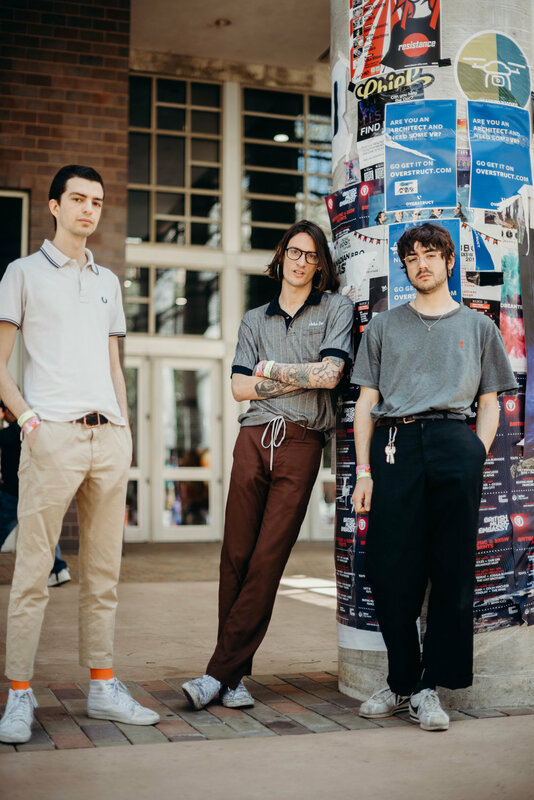 Teal Magazine: Coming from Madrid, how did it feel to play this far from home at such an important music event like SXSW? FAVX: Despite the fact that SXSW is a mainstream and massive festival, untraditional to what we’ve known, we discovered a cool and interesting underground scene in which we feel very comfortable with. For example, the "house show" concept is something that doesn't exist in Spain and we really love to play these type of shows.